To cater the increasing and diversified desires of our clients in the best possible way, we have been engaged in providing Solid Ink Coding Machine. These are highly valued amid our clients due to their features such as durability and fine finish. As well, we guarantee dispatching these coding machines at the doorsteps of our clients within the assured frame of time. 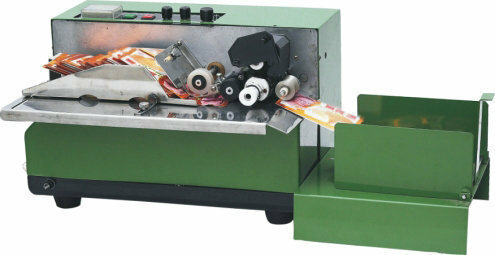 Incorporated in the year 2006, Pack Point is one of the remarkable business names thoroughly occupied in wholesaling, supplying and trading a comprehensive consignment of products comprising Strapping Machine, Wrap Machines, Sealer Machines, Shrink and Stretch Films, Solid Ink Coding Machine, Strap Roll, Handy Induction Machines, Double Chamber Vacuum Machine, Vacuum Packaging Machine, Shrink Tunnel Machines, Shrink Chamber Machine. The products we offer are manufactured and developed by employing topnotch grade material altogether with contemporary machines beneath the supervision of adroit executives. Also, our products are thoroughly inspected before getting dispatched at the premises of our clients. These presented by us in numerous provisions, these are reviewed sternly to retain their efficiency and could be modified to match with varying needs of our honored clients.